In a world where mankind is burning its final resources a few fearless warriors race for the last drops of oil. 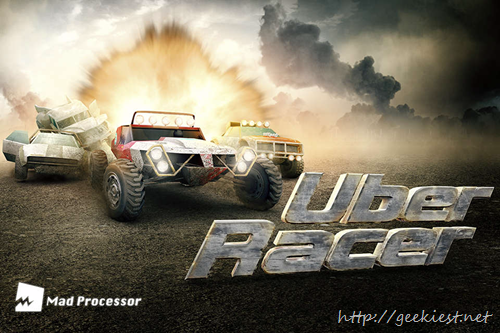 Will you stand up to become the next Uber Racer? HIGHLY DETAILED GRAPHICS - Without repeating textures (i. e. every rock is painted differently). CAREER MODE - With 31 race days, featuring up to 10 events. Several hours of playtime. 3D MENU - Completely integrated. 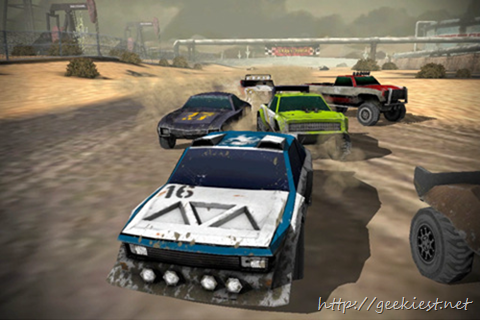 4 RACE MODES - Time Trial, Elimination, 1 Vs 1, Race. 2 CONTROL MODES - Touch and steering controls! 3D SOUND - With stereo output and positional audio. For full sound experience make sure to use headPhones! REALISTIC MOTOR SOUND - Engine simulation, backfire. 3D CAR PHYSICS - With suspension, damping, drifting, etc..
12 CARS individually - Upgradable. Ranging from buggies to race cars and trucks. DAMAGE MODEL - Based on real impact damage, flapping doors, loose hinges. THUMB TRACKING - Don't care about hitting the gas pedal. It's wherever your thumb is. When you are using steering controls. 3 CAMERA MODES -Third person, hood or bumper.